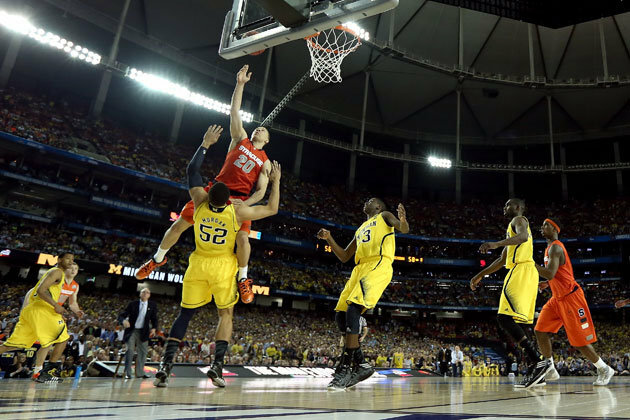 Taking a quick glance at Michigan's defensive score sheet and it doesn't take a genius (or Wolverines coach John Beilein) to tell you Michigan's second unit was the reason the Wolverines are playing in Monday's title game vs. Louisville. The Wolverines offense was exceptional in the first half with 36 points in 27 possessions (1.11 PPP) but as the clock ticked down it was defense that made the difference. While Nik Stauskas struggled along with many other starters (a pass can be given to both Tim Hardaway Jr. and Glenn Robinson III because they were both given the task of slowing down a big mismatch in the Orange's C.J. Fair and paid the price defensively) while it was the reserves who pulled Michigan to the finish line. Jordan Morgan was very much a MVP of the game. In just five minutes he forced two turnovers including the controversial-yet-undeniably-savvy drawn charge in the final minute. Throw in the above-average performances from Spike Albrecht and Caris LeVert (who also added some offensive fire as well) and Michigan looked like a team with all the pieces to win the title.